Unique is the name of the gift-giving game at Grifted. Small but full of delightfully detailed items impossible to find anywhere else in the world, Grifted is a design outlet run by long-term expats providing items for those in need of a special something. 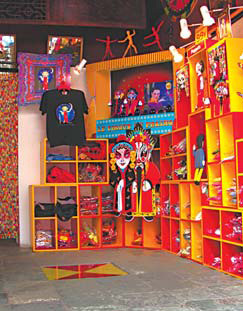 Since opening in 2007, the souvenir shop has been one of the leaders selling kitschy, original retail motifs on the art-smart strip of Nanluoguxiang. "We at Grifted believe that the physical treasures of our journeys are as important as the journeys themselves," the shop mantra boasts. Quirky and cheeky is the best way to describe the underlying concept of the high-quality merchandise. Ranging from umbrellas to T-shirts to recycled material jewelry to Peking Opera finger puppets, everything in Grifted is designed in-house, and all hand-crafted items are produced within a 1,000 m radius. Taking the concept of "acting locally and thinking globally", fresh ideas and nuances to the Grifted product line have kept the independent business going steady over the years. Splashing onto the scene with iconic "Beijing belly" T-shirts (68 yuan or buy 3, get 1 free), happy Buddha hippy umbrellas (99 yuan long handle), and used candy wrapper hand-crafted curtains (800 yuan long/500 yuan short), items available today also include re-usable cloth shopping bags (48 yuan), recycled candy wrapper crafted jewelry (18 yuan earrings, 18-38 yuan necklaces and bracelets), and an assortment of Peking Opera finger puppets (38 yuan).